“When can I play again, Doc?” is the emotionally charged, quintessential question asked by nearly every athlete after anterior cruciate ligament (ACL) injury. Invariably, the same question is one of the first asked by parents, team mates, coaches, and—in the case of the high profile athlete—the media. This implies that, to meet the expectations of the athlete and his/her surroundings, swift surgical intervention and accelerated rehabilitation becomes a priority. Therefore it is not surprising if the time to return to play is the standard by which orthopaedic surgeons measure themselves and are measured in sports circles. Measured by this standard, sports medicine has made giant advances in ACL treatment programmes during the previous decades. We have progressed from open surgery to arthroscopic surgery, from extended casting to short term bracing, from conservative to accelerated rehabilitation programmes, and from long hospital stays to outpatient surgery. When an athlete is injured today, it is expected that arthroscopic surgery will take place a few weeks after injury, that rehabilitation is started immediately, and that the patient is able to return to sport in four to nine months. The “best” surgeons and physiotherapists are rumoured to return players even sooner. Lost in the need to succeed and with the fear of defeat deeply embedded in our decision making processes, it is no wonder that we rarely ask: “Is it time to quit? Is it safe to return patients to pivoting sports? What are the long term results of our treatment programmes? Are there other criteria whereby we should measure treatment outcome than the time to return to sport?” Should we not consider the risks of a graft rupture or additional knee lesions and the likelihood of the development of early osteoarthritis (OA) when advising the athlete after the initial injury. To better address these issues, we have searched the literature for follow up studies after ACL injury examining the rate of return to sport, the reinjury risk, and/or the prevalence of OA (see table 1 for details on search terms and procedures). We have included studies of patients treated non-operatively or with reconstructive surgery who have been followed from 4 to 14 years after the initial injury. For athletes who wish to return to pivoting sports, the typical advice is an ACL reconstruction after 4–8 weeks when full range of motion is established and there is no joint swelling.1–3 The purpose of an ACL reconstruction is to give the athlete a mechanically stable knee and to reduce the risk of subsequent injury to the menisci and cartilage by reducing anteroposterior joint motion.4 A number of short term studies have shown good to excellent knee function after reconstruction, whether hamstrings5–7 or patellar tendon8 grafts are used.7 The same studies also confirm that most patients (65–88%) are able to return to sport within the first year. Thus it is fair to state that surgery is effective in allowing injured athletes to resume their sports career. Nevertheless, a few studies may be of particular interest, because they follow sports specific patient populations and report data on patients treated with and without surgery. Also, these studies mainly include elite athletes who can be assumed to be well motivated to continue their sports career. Thus the data may provide a realistic estimate of what to expect after returning to sport after injury. Myklebust et al9 found in a 6–11 year follow up of ACL injured team handball players that 58% of the reconstructed players and 82% of the conservatively treated patients were able to return to their preinjury level. In the 10–13 year follow up study with a mixed sport population, Fink et al13 found a 44% reduction in high risk sports participation in the surgically treated group compared with a 70% reduction among the conservatively treated. In the longest follow up to date, von Porat et al14 showed that, after 14 years, 6% in the operatively treated group and 1% in the conservatively treated group were still playing soccer. However, from these studies it is not possible to determine whether the players retired because of the injury or whether the retirement rate was higher than can be expected. Clearly, athletes may quit for reasons unrelated to their knee injury. One of the potential concerns with returning to sport is that the reinjury rate to the reconstructed ACL or to other structures (menisci, cartilage, or other ligaments)15,16 may be unacceptably high.17 Only few studies have examined reinjury risk, and they report a wide range of rerupture rates ranging from 2.3% to 13% (table 1).18–20 The highest ACL rerupture risk (13%) was found by Myklebust et al9 in their study of team handball players. However, one reason for the high risk seen in this study may be that team handball in itself is a high risk sport. Six of the 50 players who returned to team handball (9%) experienced an ACL tear in their contralateral, previously uninjured knee during the observation period.9 A similar reinjury rate was reported by Drogset and Grøntvedt,21 who found that 12% of their patients suffered a reinjury during an eight year follow up period, all during pivoting sports. However, these results, as well as studies reporting lower rerupture rates, must be interpreted with caution. Firstly, the population at risk is not known, because it clearly depends on the proportion returning to sport and the number of years they continued to play. Secondly, bias must be considered when there is a significant loss to follow up as is evident in most of the studies. Thus, we do not know if there is an increased risk of reinjury to the reconstructed ACL compared with a healthy knee, nor do we know the rate of meniscus or cartilage injury associated with return to sport. Nevertheless, it is clear that nearly all of the reruptures reported in the papers shown in table 1 occurred while pivoting sports were being played. Further damage to the knee with continued sports participation is of course also a concern in non-operatively treated patients. Myklebust et al9 showed that 22% of the non-operatively treated players who returned to sport underwent additional surgery for an injured meniscus compared with 12% in the operatively treated players. Returning to pivoting sport without a reconstruction results in considerable risk of injury to the menisci and cartilage. Using the rate of return to sports or even the reinjury risk as measures of treatment success may be grossly misleading. An ACL injury entails a significant risk of OA,22 and it may be that the initial injury itself is an important determinant of the development of OA, no matter what treatment is used or how the knee is loaded during subsequent years. 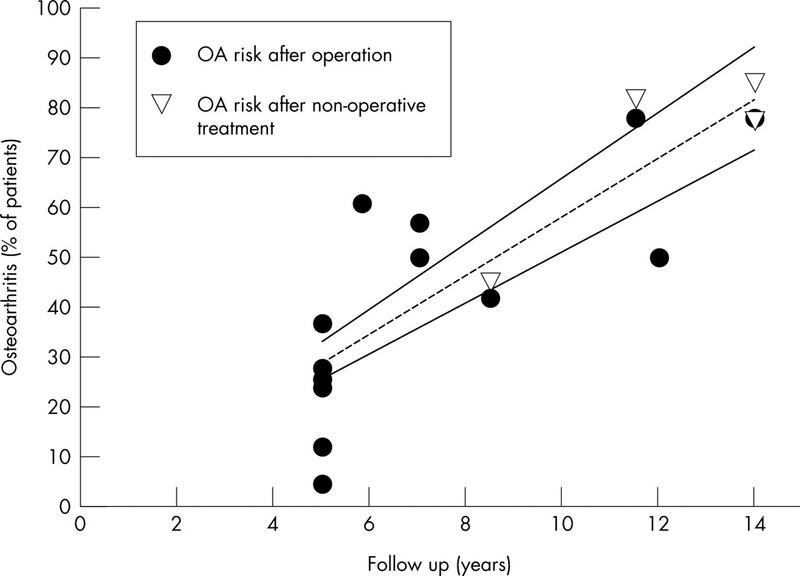 Figure 1 shows the risk of developing radiological signs of OA with time after an ACL injury. After 10 years, approximately half of the patients display signs of OA. An extrapolation of these results indicates that nearly all patients will have OA after 15–20 years. A recent study showed that all athletes undergoing revision ACL surgery had OA when they were re-examined 37 (12–58) months after the reoperation30 (because this study includes patients with two or more ACL injuries, it could not be included in fig 1 or table 1). It seems that a high frequency of radiographic changes is the rule rather than the exception after ACL injury. Anterior cruciate ligament (ACL) follow up studies and osteoarthritis (OA) prevalence. OA risk after both reconstructive surgery with bone-patella-tendon-bone graft or hamstring graft and non-operative treatment is shown. The dashed line indicates the forced regression (y = 6.0 t; r = 0.85) between time (t) and OA prevalence (y), with the 95% confidence intervals shown by thin solid lines. Follow up studies describing partial ACL ruptures or reconstructive surgery with sutures only are omitted. These findings raise two important questions. Firstly, is there a difference in the risk of OA between surgically treated and non-operatively treated patients? Unfortunately, there are no prospective trials in which patients have been randomised to a reconstruction or non-operative treatment. In the three follow up studies that include surgically and non-operatively treated patients there may be a selection bias, which makes it difficult to interpret the results. Nevertheless, as shown in fig 1, the prevalence of OA does not seem to depend on whether an ACL reconstruction was performed or not. von Porat et al14 reported 78% OA prevalence in both groups after 14 years, Fink et al13 78% v 83% after 10–13 years, and Myklebust et al9 42% v 46% after 6–11 years. Thus there is no evidence to suggest that ligament reconstruction prevents future OA. The second question is: is there an increased risk of OA in athletes who return to sports compared with those who choose to retire? For obvious reasons, there is no study in which athletes have been randomised to continued sports participation or early retirement. Furthermore, although it would have been interesting to compare OA prevalence between athletes who chose to retire and those who continued to play, these data have not been reported in the available studies. Therefore there is an urgent need to establish large prospective studies to follow cohorts of athletes with ACL injury. Using a multivariate approach, it will then be possible to assess the independent effects of treatment methods, associated injuries to the menisci and cartilage at the time of injury, graft choice, reinjuries, and continued sports participation, to mention a few factors that could be important for the development of early OA. In 1970 Kennedy stated that “the ACL is the most common cause of the ex-athlete.”31 In other words, the treatment offered at the time did not permit athletes to go back to sport. This is no longer the case, at least in the short term, thanks to major advances in surgical treatment and rehabilitation programmes. As shown above, most elite athletes are initially able to resume their sports career. However, the data also show that the retirement rate may be higher among athletes with a previous ACL injury compared with healthy athletes. Furthermore, it is apparent that there is a significant risk of reinjury to the graft, as well as the menisci and cartilage with continued sports participation. Finally, there are convincing data to show that nearly all patients will develop OA with time. Fox JA, Nedeff DD, Bach BR Jr, et al. Anterior cruciate ligament reconstruction with patellar autograft tendon. Clin Orthop 2002:53–63. Haddad FS, Oussedik SI. Cruciate ligament reconstruction. Hosp Med2004;65:412–17. Grant JA, Mohtadi NG. ACL reconstruction with autografts, weighting performance considerations and postoperative care. Phys Sportsmed2003;31:27–40. Fithian DC, Paxton LW, Goltz DH. Fate of the anterior cruciate ligament-injured knee. Orthop Clin North Am2002;33:621–36. Siegel MG, Barber-Westin SD. Arthroscopic-assisted outpatient anterior cruciate ligament reconstruction using the semitendinosus and gracilis tendons. Arthroscopy1998;14:268–77. Gobbi A, Tuy B, Mahajan S, et al. Quadrupled bone-semitendinosus anterior cruciate ligament reconstruction: a clinical investigation in a group of athletes. Arthroscopy 2003;19:691–9. Feller JA, Webster KE. A randomized comparison of patellar tendon and hamstring tendon anterior cruciate ligament reconstruction. Am J Sports Med2003;31:564–73. Corry IS, Webb JM, Clingeleffer AJ, et al. Arthroscopic reconstruction of the anterior cruciate ligament. A comparison of patellar tendon autograft and four-strand hamstring tendon autograft. Am J Sports Med 1999;27:444–54. Myklebust G, Bahr R, Engebretsen L, et al. Clinical, functional and radiological outcome 6–11 years after ACL injuries in team handball players: a follow-up study. Am J Sports Med 2003;31:981–9. Roos H, Ornell M, Gardsell P, et al. Soccer after anterior cruciate ligament injury: an incompatible combination? A national survey of incidence and risk factors and a 7-year follow-up of 310 players [see comments]. Acta Orthop Scand 1995;66:107–12. Eastlack ME, Axe MJ, Snyder-Mackler L. Laxity, instability, and functional outcome after ACL injury: copers versus noncopers. Med Sci Sports Exerc1999;31:210–15. Fitzgerald GK, Axe MJ, Snyder-Mackler L. The efficacy of perturbation training in nonoperative anterior cruciate ligament rehabilitation programs for physical active individuals. Phys Ther2000;80:128–40. Fink C, Hoser C, Hackl W, et al. Long-term outcome of operative or nonoperative treatment of anterior cruciate ligament rupture: is sports activity a determining variable? Int J Sports Med 2001;22:304–9. Von Porat A, Roos EM, Roos H. High prevalence of osteoarthritis 14 years after an anterior cruciate ligament tear in male soccer players: a study of radiographic and patient relevant outcomes. Br J Sports Med2004;38:263. Aroen A, Loken S, Heir S, et al. Articular cartilage lesions in 993 consecutive knee arthroscopies. Am J Sports Med 2004;32:211–15. Tandogan RN, Taser O, Kayaalp A, et al. Analysis of meniscal and chondral lesions accompanying anterior cruciate ligament tears: relationship with age, time from injury, and level of sport. Knee Surg Sports Traumatol Arthrosc 2004;12:262–70. Jones H P, Appleyard RC, Mahajan S, et al. Meniscal and chondral loss in the anterior cruciate ligament injured knee. Sports Med 2003;33:1075–89. Sandberg R, Balkfors B. Reconstruction of the anterior cruciate ligament. A 5-year follow-up of 89 patients. Acta Orthop Scand1988;59:288–93. Otto D, Pinczewski LA, Clingeleffer A, et al. Five-year results of single-incision arthroscopic anterior cruciate ligament reconstruction with patellar tendon autograft. Am J Sports Med 1998;26:181–8. Bak K, Scavenius M, Hansen S, et al. Isolated partial rupture of the anterior cruciate ligament. Long-term follow-up of 56 cases. Knee Surg Sports Traumatol Arthrosc 1997;5:66–71. Drogset JO, Grontvedt T. Anterior cruciate ligament reconstruction with and without a ligament augmentation device : results at 8-year follow-up. Am J Sports Med2002;30:851–6. Engebretsen L, Arendt E, Fritts HM. Osteochondral lesions and cruciate ligament injuries. MRI in 18 knees. Acta Orthop Scand1993;64:434–6. Lohmander LS, Saxne T, Heinegard DK. Release of cartilage oligomeric matrix protein (COMP) into joint fluid after knee injury and in osteoarthritis. Ann Rheum Dis1994;53:8–13. Drawer S, Fuller CW. Propensity for osteoarthritis and lower limb joint pain in retired professional soccer players. Br J Sports Med2001;35:402–8. Shepard GJ, Banks AJ, Ryan WG. Ex-professional association footballers have an increased prevalence of osteoarthritis of the hip compared with age matched controls despite not having sustained notable hip injuries. Br J Sports Med2003;37:80–1. Kujala UM, Kettunen J, Paananen H, et al. Knee osteoarthritis in former runners, soccer players, weight lifters, and shooters. Arthritis Rheum 1995;38:539–46. Brandsson S, Faxen E, Kartus J, et al. A prospective four- to seven-year follow-up after arthroscopic anterior cruciate ligament reconstruction. Scand J Med Sci Sports 2001;11:23–7. Lewek MD, Chmielewski TL, Risberg MA, et al. Dynamic knee stability after anterior cruciate ligament rupture. Exerc Sport Sci Rev 2003;31:195–200. Eberhardt C, Wentz S, Leonhard T, et al. Effects of revisional ACL surgery in semi-professional athletes in “high-risk pivoting sports” with chronic anterior instability of the knee. J Orthop Sci 2000;5:205–9. Fowler PJ, Snyder-Mackler L. Commentary. J Orthop Sports Phys Ther2001;31:661. McDaniel WJJ, Dameron TBJ. The untreated anterior cruciate ligament rupture. Clin Orthop1983:158–63. Ruiz AL, Kelly M, Nutton RW. Arthroscopic ACL reconstruction: a 5–9 year follow-up. Knee2002;9:197–200. Johma NM, Pinczewski LA, Clingeleffer A, et al. Arthroscopic reconstruction of the anterior cruciate ligament with patellar-tendon autograft and interference screw fixation. J Bone Joint Surg [Br] 199 81:775–9. Scavenius M, Bak K, Hansen S, et al. Isolated total ruptures of the anterior cruciate ligament: a clinical study with long-term follow-up of 7 years. Scand J Med Sci Sports 1999;9:114–19. Jennings S, Rasquinha V, Dowd GS. Medium term follow up of endoscopically assisted BPTB ACL reconstruction using a two-incision technique: return to sporting activity. Knee2003;10:329–33. Howe JG, Johnson RJ, Kaplan MJ, et al. Anterior cruciate ligament reconstruction using quadriceps patellar tendon graft. Part I. Long-term follow up. Am J Sports Med 1991;19:447–57. Pinczewski LA, Deehan DJ, Salmon LJ, et al. A five-year comparison of patellar tendon versus four-strand hamstring tendon autograft for arthroscopic reconstruction of the anterior cruciate ligament. Am J Sports Med 2002;30:523–36. Ferretti A, Conteduca F, De Carli A, et al. Osteoarthritis of the knee after ACL reconstruction. Int Orthop 1991;15:367–71. Cooley VJ, Deffner KT, Rosenberg TD. Quadrupled semitendinosus anterior cruciate ligament reconstruction: 5-year results in patients without meniscus loss. Arthroscopy2001;17:795–800. Patel JV, Church JS, Hall AJ. Central third bone-patellar tendon-bone anterior cruciate ligament reconstruction: a 5-year follow-up. Arthroscopy2000;16:67–70. Wang CJ, Huang TW, Jih S. Radiographic assessment of the knee after patellar tendon reconstruction for anterior cruciate ligament deficiency. Chang Gung Med J2004;27:85–9. Bak K, Jorgensen U, Ekstrand J, et al. Reconstruction of anterior cruciate ligament deficient knees in soccer players with an iliotibial band autograft. A prospective study of 132 reconstructed knees followed for 4 (2–7) years. Scand J Med Sci Sports 2001;11:16–22.